There are few sensations quite as glorious as sinking into a hot bath on a chilly winter’s night, and if that bath happens to be scented with wonderful salts and oils, that can rival a spa experience for relaxation and de-stressing. Add some luxurious, moisturizing body scrubs and lotions into the mix, and you have a spectacular gift package for someone special. The personal care products listed below are easy to make (mostly with regular household ingredients), and would make beautiful presents for friends and loved ones this holiday season. All of these products are scented with essential oils, and there are so many out there that choosing one or two can be difficult. 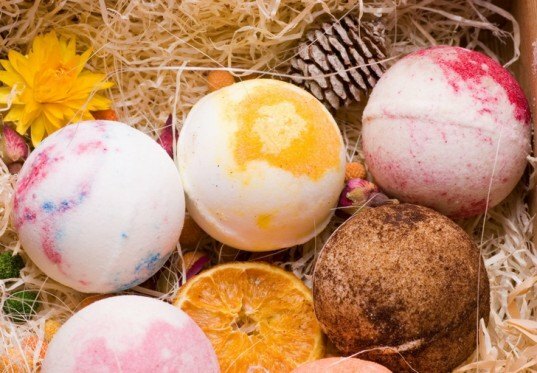 For bath and body products, I’d recommend scents such as tangerine, lavender, rose, ylang-ylang, cedar, jasmine, grapefruit, sandalwood, cinnamon, and mint. 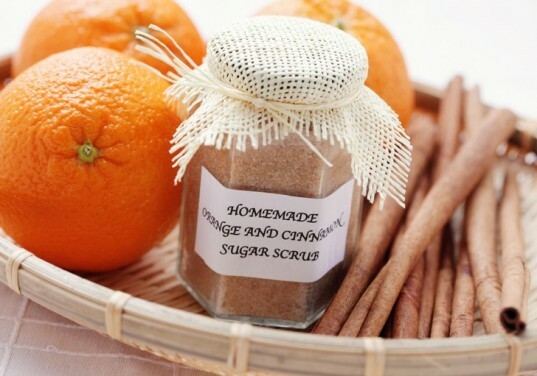 Be sure to find out which scents your recipients prefer, and whether they have any sensitivities to scent (or plants) before making any of the products listed below—the last thing you want is to cause an allergic reaction or dermatitis as a special holiday treat. 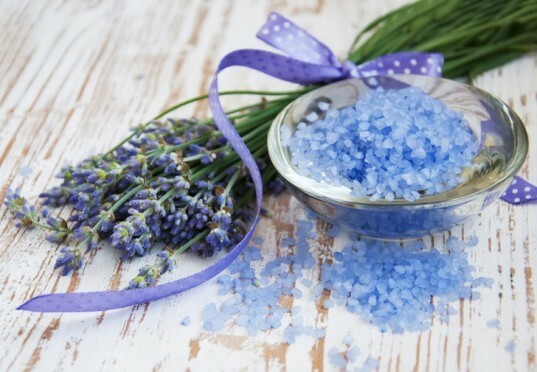 An Epsom salt bath soak is detoxifying, can alleviate stress and tension, and does wonders for the skin. Try using scents like lavender, jasmine, and cedar for a calming bath, or citrus scents like grapefruit, orange, tangerine, or lemon for clarity and joy. 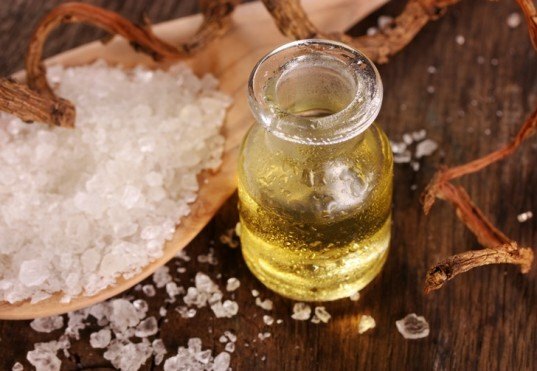 Mix the salts together in a large bowl, then sprinkle in the essential oil. Mix well with a whisk or a fork to break up any clumps that may form, then add baking soda and mix well. Pour into decorative glass jars or bottles. Luxurious and soothing, milk baths have been popular since the Roman era, and with good cause! You can scent this in many different ways in order to suit your recipient’s personal preferences. Mix the powdered milk and Epsom salts together, and if desired, and add 2-3 drops of food coloring (if desired), mixing well so that the color is uniform. You can skip this step if you like, although there’s something sweet about having the hue match the scent—a few drops of red coloring will create a soft pink that’s ideal for grapefruit or rose scents, while orange is great for a tangerine-vanilla bath, light purple for lavender, and so forth. After you’ve mixed the milk and salt together, add 5-8 drops of essential oil. 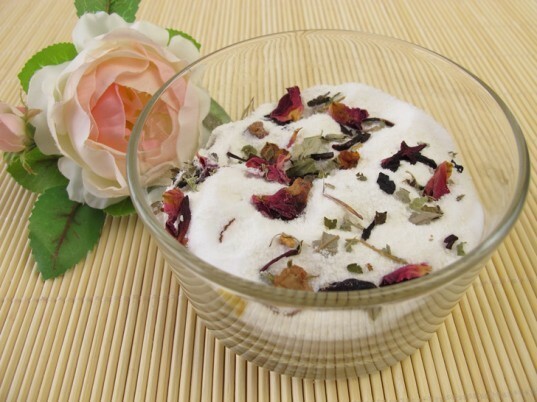 If you’re creating a floral bath milk, you can mix in about 1/2 a cup of flower petals as well. Mix it all well, then decant into a pretty glass bottle or jar, and you’re done. *Note: If you’re making a lavender or chamomile bath milk, recommend to the recipient that they use a tea strainer or cheesecloth for the bath, or else they’ll have to deal with a bunch of small floaty petals, which can be rather frustrating to corral. Mix the liquid soap, glycerin, water, and essential oil together in a measuring cup that has a spout on it. 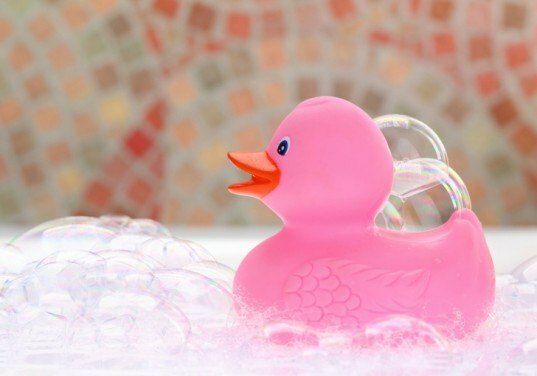 If desired, add a few drops of food coloring that suits the bubble bath’s scent (as mentioned with the milk bath above), and then decant into a decorative bottle or mason jar. Fun and fragrant, these little balls are perfect stocking-stuffers, and make fun additions to any gift basket. I have to admit that I’ve never made them myself, but this DIY recipe sounds like a good one to try! Mix your dry ingredients, then add the oils and food coloring (if desired). Spray the mixture with water until it starts to clump together and has the consistency of wet sand. Once mixed and damp, pack into molds as tightly as possible, then pop them out and let them rest for 2 to 3 days to dry out. Keep in mind that this scrub needs a few days to cure, so be sure to make it at least 4 days before you plan to give it as a gift. (A full week would be better). Pour the coconut oil into the jar, and follow a generous handful of rose petals. Add the sugar and finish off with the almond or jojoba oil. When you give this as a gift, be sure to add instructions so your recipient knows to mush it all together first, then massage it into the skin and rinse well. 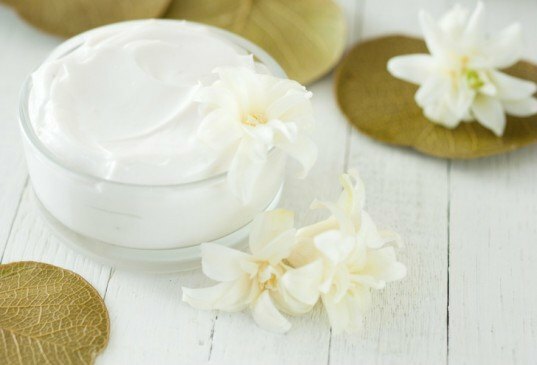 In all honesty, my favorite body lotion is the same moisturizing hand cream that I use for both my face and hands; I just make a larger batch of it, and try out different scents now and then. Feel free to mix and match any of these to create the ideal present for someone special, and add any bits that you feel would go along well with them. For example, you could add a bar of designer soap, a pumice stone, an organic loofah or cotton washcloth, and a few lip balms, or eventuck in a couple of handmade candles; there’s nothing quite like basking in candlelight while bathing, especially during the season of light and peace. An avid permaculture gardener, locavore, and novice (but enthusiastic!) canner, Lana Winter-Hébert joins Inhabitat after spending the last decade working as a writer and event guru for non-profit/eco organizations. She has contributed to both print and web-based media for clients across North America and Europe, and is slowly plodding her way through her first novel-writing attempt. Born and raised in Toronto, she has given up city life and moved to the wilds of rural Quebec with her husband, where they collaborate on graphic design projects for their company, Winter-Hébert. Their new, rustic lifestyle is chronicled in her two personal blogs: 33 Leagues from Mount Royal, and The Green Pigeon, where she delves into the ins and outs of homesteading and self sufficiency in the Great White North. When she isn’t writing or delving into artstuffs, Lana can be found reading, wrestling with various knitting projects, or tending her garden. I have been making homemade bath products for almost a year and a half now. Took me nearly 6 months of that time to perfect my bath bomb recipe...please please PLEASE for the love of all things good in this world do NOT use water when making bath bombs! Even if you use the spray bottle method they will eventually expand after they have been molded. Never ever use water when there is citric acid. Use 91% rubbing alcohol. I know it smells horrid but it will fade I promise, and it has to be 91%, 70% will activate the citric acid. Some people also like to use witch hazel but I have never had any luck with that. But thanks for some great ideas! Definitely going to be trying out a few!! I love this! You have so many good idea's I never thought of trying! There are few sensations quite as glorious as sinking into a hot bath on a chilly winter's night, and if that bath happens to be scented with wonderful salts and oils, that can rival a spa experience for relaxation and de-stressing. Add some luxurious, moisturizing body scrubs and lotions into the mix, and you have a spectacular gift package for someone special. 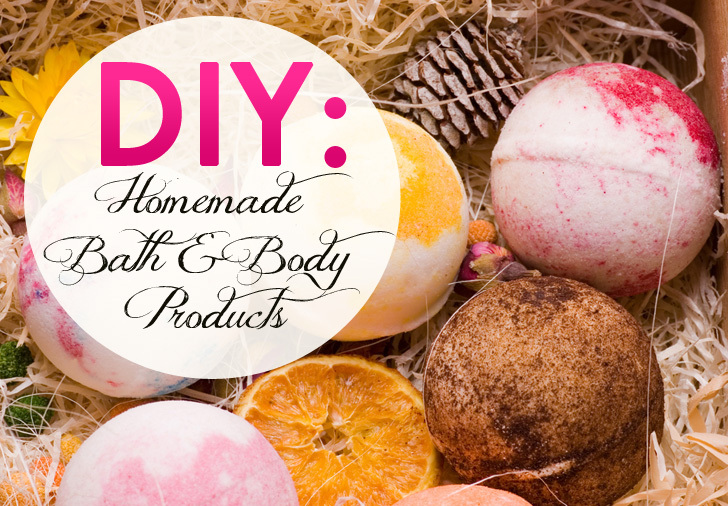 The personal care products listed below are easy to make (mostly with regular household ingredients), and would make beautiful presents for friends and loved ones this holiday season.